This article is an image. Please see the PDF version of this issue, page 20. … continue reading. This article is an image. Please see the PDF version of this issue, page 15. … continue reading. This article is an image. Please see PDF version of this issue, page 8. … continue reading. This article is an image. 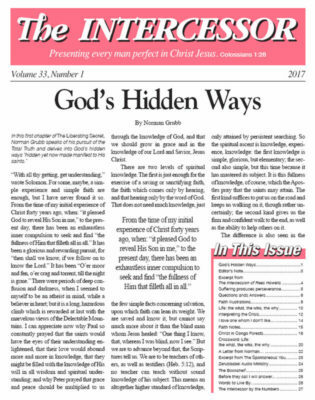 Please see PDF version of this issue, page 6. … continue reading. "It was not you who sent me here, but God." --Genesis 45:8 Everything that comes to us comes from God--what we call evil as well as the good. God, of course, is not the cause of evil, but … continue reading. "Knowing this, that our old man is crucified with him, that the body of sin might be destroyed, that henceforth we should not serve sin." --Romans 6:6 Self cannot put self on the Cross: only the … continue reading. In our spirits we are undifferentiated. That is where we are all one person in Christ. In our souls we all vary, and are meant to. That is why the salvation of our souls is a necessity, because it is … continue reading. 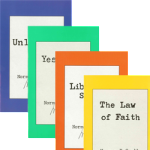 In this first chapter of The Liberating Secret, Norman Grubb speaks of his pursuit of the Total Truth and delves into God's hidden ways "hidden yet now made manifest to His saints." "With all thy … continue reading. As C.T. Studd and his fellow missionaries were establishing and carrying on the work of the Heart of Africa Mission in the Belgian Congo, questions arose at home in England about the financial … continue reading. "Suffering produces perseverance; perseverance, character; and character, hope." --Romans 5:3-4 Daily life is by no means just easy, smooth-running times. It is constantly disturbed by things … continue reading. Dear Molly, Lovely, dear, to have your news of the Lord’s workings in the family, and in the fellowship. What we do will always appear fanatical to those on other wave-lengths, but how right you … continue reading. The following is Part One of Page Prewitt's booklet "Life: The What, The Who, the Why," copies of which are available from Zerubbabel. Foreword “Life: The What, The Who, The Why” by Page Prewitt … continue reading. Following a crisis of faith experienced by Norman Grubb and shared in his book Once Caught, No Escape, this excerpt lays out the revelation that followed. Part One The heart of the stabilizing … continue reading. The Bible is clear that wisdom and the knowledge of God are the most valuable things a person can acquire. Proverbs chapters 1-3 have powerful things to say about the importance of gaining them. The … continue reading.